For many, the humble watch is no longer relevant now that smartphones exist, but you only need to wander around the huge halls at the Baselworld watch fair, peer into the display cases holding the best watches that only Premier League footballers could afford to tell you that the time has not run out for the wrist worn device just yet. Speculation continues to mount that the likes of Apple and Samsung could be venturing into the watch-making business and while that may not have Rolex and Tag Heuer quaking in its boots, a company like Casio who have been making digital and analogue watches for some time could perhaps feel the affects of a major tech player like Apple wading in on its territory. To discuss all things watches, both smart and traditional, we sat down with Casio Edifice Design Manager Mr Moriai, Global Marketing Manager Mr Shimazu and Manager of R&D Mr Karasawa all based out of Casio headquarters in Japan plus Head of Casio Marketing Tim Gould to find out about its new Edifice watch brand, its relationship with technology innovators Red Bull and whether they are worried about the chaps from Cupertino. What was the inspiration behind the Edifice brand? Basically we have a concept called and 'Speed and Intelligence'. We always want to keep some brains or intelligence using our original movement. On this occasion we have introduced a sensor chronograph which is our theme for Edifice this year. We have focused on developing the compass sensor. In the past the compass sensor was the size of the watch face. We have now been successful in miniaturizing that so it's been downsized by almost 95%. Tim: Casio is quite a unique brand because we are a technology company and what we have been able to do with Edifice is combine technology with things like our processors and combine that with a traditional analogue watch. So this is a unique position. 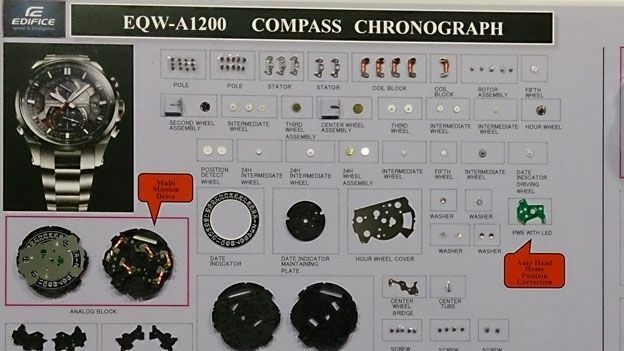 Analogue has always been thought of as mechanical and now we can use our processors to do different things like the compass or other sensors that can be illustrated with analogue dials. That means we have a unique combination of these two things. How did the relationship with Red Bull Racing come about? The Red Bull racing team is very different from teams like McLaren and Ferrari. They are the established Formula 1 teams. Red Bull Racing are a new chapter in Formula 1 racing, they are radical and have new ideas. They are very enthusiastic and young so that's why we built the synergy. They are quite intelligent which is integral to achieving the performance so that's why we felt a strong synergy with them. Tim: There is a real synergy between the two in terms of technology, the way that they approach design and the way that they approach everything that they do in terms of production. It is always a good synergy with Casio also trying to push the boundaries of the watch brand. How involved does Red Bull get in the design and manufacturing process? We actually carried out some research with their engineers. We sent some staff to visit their factories and at that time we did some interviews with some of the mechanics who said they wanted 'that' kind of watch and 'that' kind of function. For instance, the compass itself doesn't seem to have any connection with Red Bull Racing, but actually they travel a lot. They appreciate the World Time feature and also like the compass. There are lots of things we can learn from them. So Red Bull likes to be very hands-on with the process? Yes they do. That's very good for us because it draws the two brands together. It makes it more about sponsorship which is something that anyone can do. It's actually about two different things trying to push the boundaries. For the latest Edifice watch we have a used a vibration resistant structure, it really comes from their request. At the initial stages, we had a general movement Edifice. Sometimes we supply them to test and we want them to survive tough situations like being in the pits. Are there any other companies that you would love to work with? There's another side to Edifice which is the marine side, so obviously this is taking existing technologies like the compass. The marine is a new area to go into. We are not looking specifically at partners at the moment. But yes, we can learn from different industries. There has plenty of speculation that Apple and Samsung are in the process of making smartwatches. What is Casio's take on the smartwatch? We launched a Bluetooth low energy G-Shock which launched last year. This is the kind of technologies we could establish. We have plans to expand how we can give more user benefits based on this Bluetooth support and that's where we are now. Tim: You can imagine as a technology company we are going to want to develop in this direction. Without giving too much away, we have learnt from Bluetooth that you press the button on the watch and alert the phone, you can receive alerts which are basic things you can do with it. We are obviously looking to add more functionality to that but there is nothing to be released at the moment. We are proud with Edifice to have technology and have it expressed in an analogue way. We will always push those two things together because the smartwatches from other competitors will always be a smart digital watch with some smart technologies. Looking to the future we would only be looking to do something that we could do which is use technology with an analogue. So do you plan to make Casio watches more compatible watches with smartphones in the future? Yes. We believe that the smartphone is a great tool for us to be able to link with the watches. We want to understand what functions of a phone will be paired with a watch so the watch can be a useful tool when the phone is in your wrist, rather than in your pocket. From a Casio perspective, what would a company like Apple or Samsung have to get right about bringing a smartwatch to market? We always have this idea that we want to develop and then then the consumer sees the product and have their own ideas about how they want to use it. So I think that's it very important to learn from the consumer as to what they actually want. I think any company going forward wants to make sure they can develop a technology. Then they want to listen to the consumer and find out how they want to use that technology. We are in the very early process of doing that ourselves, it's something that we are very keen to push forward. We are the kind of watch manufacturers where one thing we have to protect is that don't break the design of the watch. Sometimes in the past we have had big GPS watches. We think that wasn't correct. It didn't stay in the market for longer than maybe one or two years. We don't want to repeat that kind of thing. This time with Bluetooth, it fits in the G-Shock case and didn't harm the design of the watch. Tim: We had wrist technology many years ago. Wrist technology originally came from the calculator watch, we had an MP3 watch, we had a camera watch for a while. We have always gone towards the technology. Now we want to harmonize the technology in an existing and successful design. That means the people can still have the pleasure of the watch and they can still get the experience of something that's not breakable and tough. We don't compromise the design of the watch but we add the technology, as opposed to making something around the technology. We would like to keep our Casio quality standard. It should have a certain level of longevity and durability and we will keep that quality of our watch. Customers expect especially from a watch company something that won't need to be replaced in a year's time like a smartphone. The watch functions is still an important part. Is it any concern that tech companies like Apple who have such a huge consumer appeal could be wading into your territory? It doesn't concern us. It's competitiveness. Competitiveness pushes design and that's for the benefit for the consumer. All competition is good and improves products. Better products with better user interfaces or new things and that can only help us develop. We don't worry about it too be honest. It inspires us to make better products. Fitness tracking tech is major consumer technology trend at the moment. Is that something that Casio will look at in the future? Maybe. We will develop functionality in the product that the consumer wants. So that's as much as I can say at the moment. If people want to see new things, people can be reassured that Casio will be at the forefront of these things. What exciting trends do you see for watches in general? Swiss brands particularly are moving towards more retro and vintage tastes. Most of the brands are celebrating their anniversaries so they will often release the original and we definitely seeing a lot of this.